brought up, got the education or just had been there and instantly fell in love with its beauty. Cities in India have diverse and rich cultural heritage. You just name the city and your mind can easily associate it with the culture, heritage, places and stuff it is famous for. If we hear the word Kashmir, our mind quickly associates the name with the most beautiful snow clad mountains, house boats on mirror-calm Dal lake, apples, saffron, pashmina shawls and women clad in beautiful traditional attires. Why am I talking about Indian cities today? Well, I have a fun thing here. I have always wanted to visit the oldest and the most revered city Varanasi but never got a chance. So I planned to bring in the look of this beautiful city in my home. Are you excited? well, I am super excited to show you how I achieved the look. Varanasi or Banaras, earlier known as Kashi, situated on the banks of river Ganges is the spiritual capital of India. The city is rich in cultural heritage and is said to be the world's oldest continually inhabited city. This city has something mystical about it and I always feel drawn towards it. 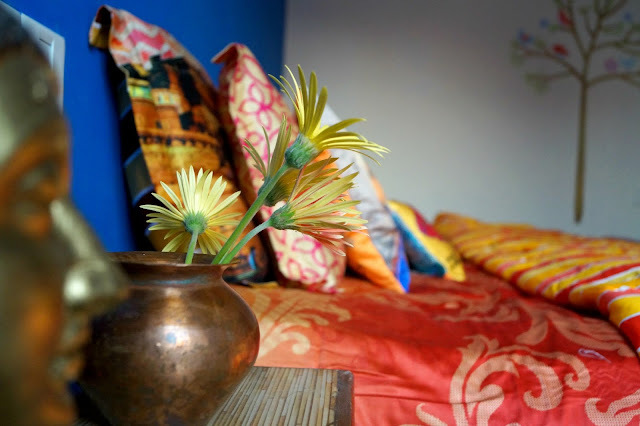 That was the reason I planned to bring in the look of Banaras in my decor. In my mind, I had a clear sketch of the elements that will find a way in my Banaras inspired decor. Banaras is famous for its beautiful and world renowned ghats, boat ride on the Ganges across the ghats early in the morning, splendid Aartis with life-sized brass diyas in the evening, flickering lights of tiny floating diyas on leaf bowls across the Ganges, Sadhus (Monks) performing rituals at the bank of river Ganga and sanctified atmosphere enhanced by sonorous temple bells. All these elements together define Banaras. 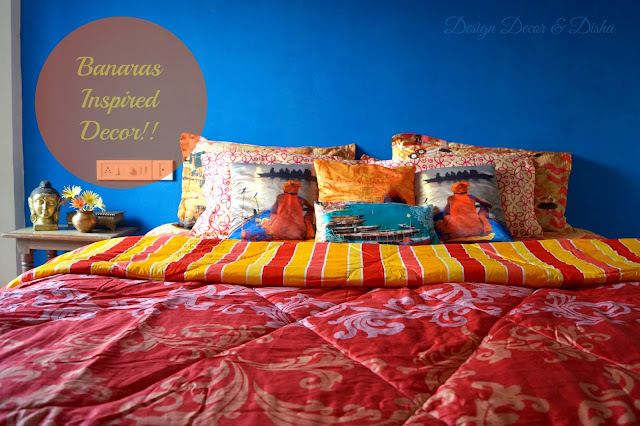 Bringing all these elements together for my Banaras inspired decor seemed quite impossible. But then Tangerine's Indie Tadka collection came to the rescue. 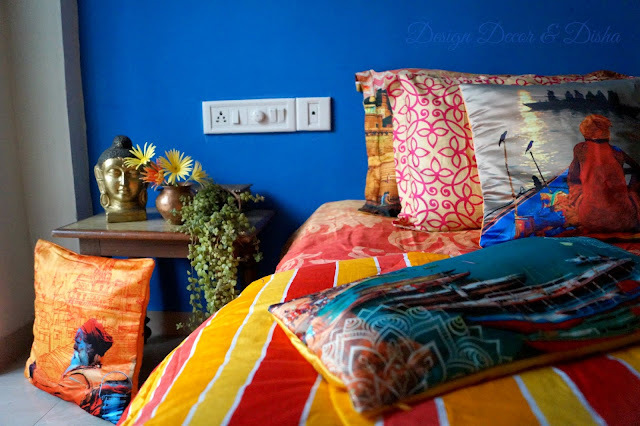 Tangerine has launched its new collection of bed linen, cushions and home accessories called Indie Tadka that features thirteen beautiful cities of India and has infused the soul of the cities in their collection very well. 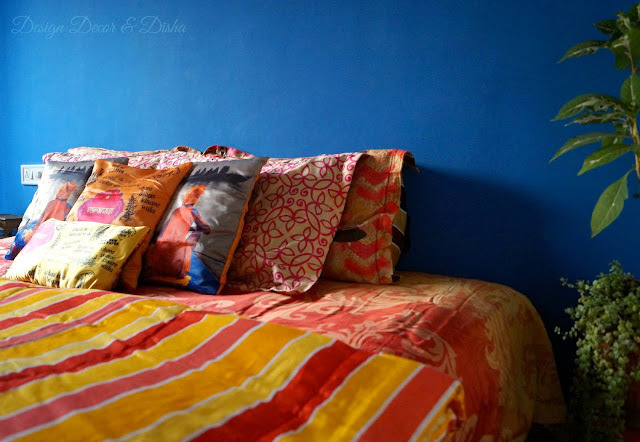 Banaras being one of them I quickly picked up the collection and began styling my space. Be it colour, texture or motif, Tangerine has captured the real essence of Banaras in an elegant way. 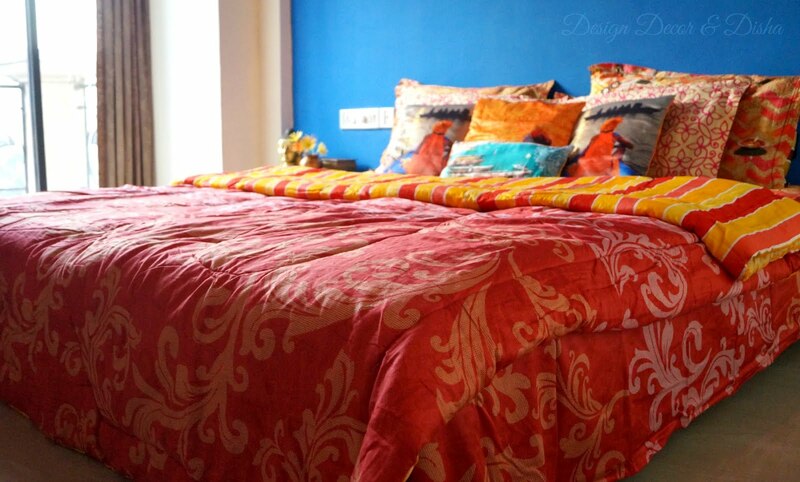 Ethnic prints and bright colours of the collection invoke the feeling of being at the ghat of Banaras. The collection is carefully curated, keeping every minute detail in mind. 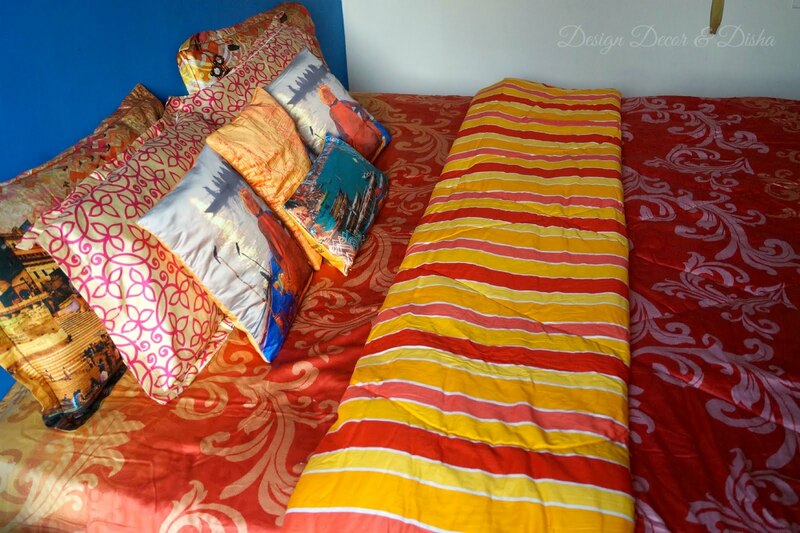 Shams, pillows, cushions and neck pillow blend well with bed linen and duvet. A bit quirky and kitschy but these cushions are certainly a show stealer. 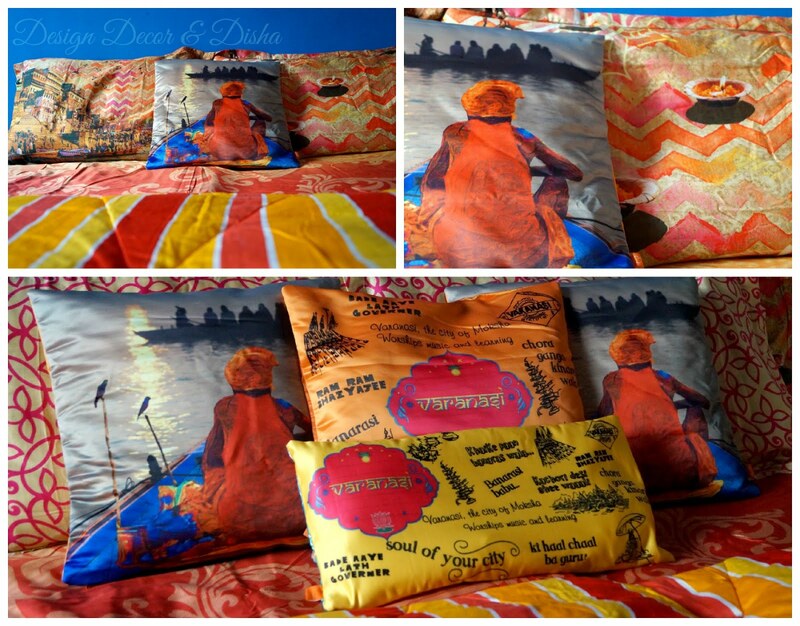 Pillows and cushions reflecting the life on ghats of Banaras in a way I described above. Boatman rowing boat on a sunkissed Ganges river, crowded ghats with unending spiritual grace and some famous slang words in Banaras, all this beautifully captured on the cushions. 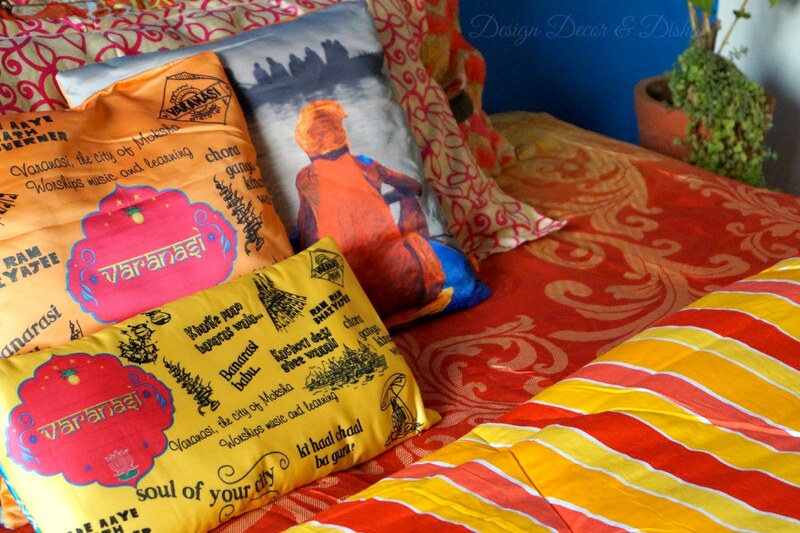 "Ki haal chaal ba guru"
"Ram Ram bhaiyajee"......are some slang words printed on cushions that depict the life in Banaras very well!! 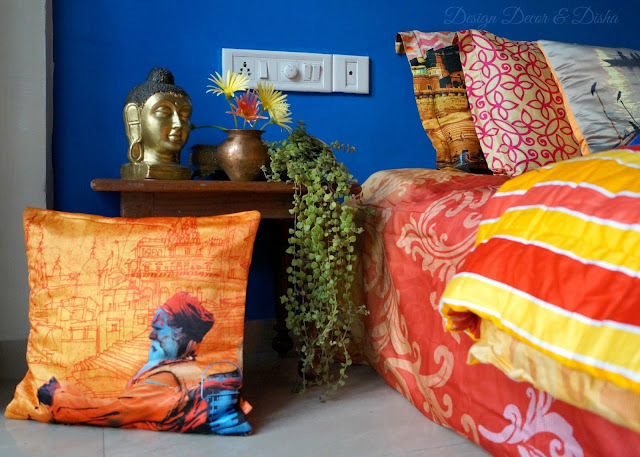 Though there was nothing left for me to achieve Banaras inspired look as Tangerine's Indie Tadka collection has already done that for me, I did try to introduce some elements that are associated with Banaras like Buddha and copper kalash to complete the look. Quality wise I will give 10/10 to Tangerine Indie Tadka collection. The collection is known for its stitch quality and colour fastness. There is a lot more for you to explore about Tangerine. Click the links below and check out their entire collection. Recently I had been to Goa and instantly fell in love with this laid back and beautiful city. I have been sharing my experience on my Instagram, check out here. Do you want to know what's coming up next? Well, it is about recycling, upcycling and saving our environment. Stay tuned to know how almost everything can be recycled/upcycled! !